The most underrated Avenger is getting his very own show. Sources close to the Walt Disney Company relayed to Variety on Wednesday that the House of Mouse has put into development a limited series all about Hawkeye, set for exclusive release on the upcoming streaming platform Disney+. 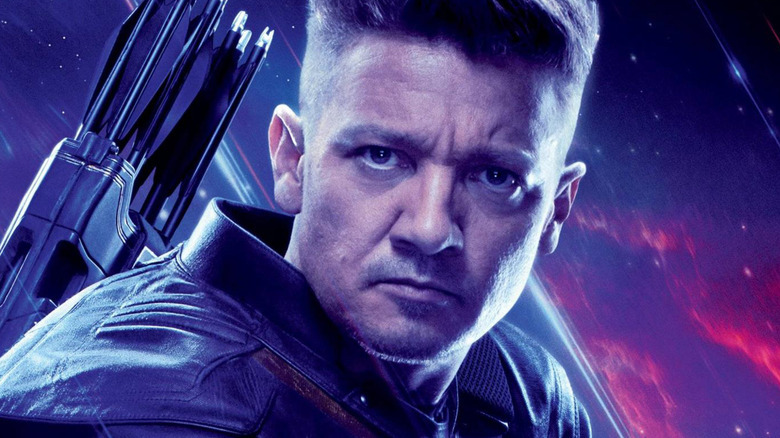 Jeremy Renner, who has played the arrow-flinging hero in the Marvel Cinematic Universe since 2012's The Avengers (after making an uncredited cameo appearance in Thor), is attached to lead, so no worries about some schmuck stepping in and stealing the role Renner is famous for. Details on the Hawkeye-centred series are relatively sparse for the time being, though Variety offered up the main premise: the project is described as an "adventure series" and will see Clint Barton "pass the torch" to Kate Bishop. A member of the Young Avengers team, Kate assumes the Hawkeye mantle in the Marvel comics after — spoiler alert — Clint dies following a lethal attack carried out by a crazed Scarlet Witch. Even after Clint was revived and took back his Hawkeye name, Kate continued using the moniker as her own. (How's that for a headstrong heroine?) Eventually, Clint trains Kate and gives her tips and tricks on how to become an ace archer, while Kate learns that the hero whose footsteps she followed in is far more complex than she imagined. They don't cross paths very often, as the two Hawkeyes base themselves on opposite coasts of the U.S., but they do commit themselves to the same mission: protecting Earth from forces of evil. It's assumed that Avengers: Endgame might introduce Kate, though not with an adaptation of the heroine that's accurate to the comics. Theory-crafters speculate that Clint Barton's daughter, Lila, may be the Kate Bishop character within the MCU. This idea is rooted in a single scene sprinkled throughout various Endgame trailers: Clint teaching his Lila to fire an arrow at a target on a tree. Rumor has it that 13 Reasons Why actress Katherine Langford, who was cast in Endgame in October of 2018, is playing that teenage version of Lila. Now, before you start crying out that Lila Barton and Kate Bishop have different names and different backgrounds, and that there's no way Lila could be the Kate Bishop in Disney+'s upcoming series, let us remind you that Marvel is infamous for its secrecy and calculated misdirection. It stands to reason that Marvel, a subsidiary of Disney, really will introduce Lila as a take on the Kate character in Avengers: Endgame and include her in the show — but the company is simply sticking with referring to her as Kate Bishop for now because calling her anything else would be a huge spoiler. If Lila genuinely is our Kate Bishop in the MCU, she might still use that name as a pseudonym, so comic book purists can at least get a little relief if that happens. It wouldn't be a stretch to have a different girl become Kate Bishop/the second Hawkeye on the series, particularly because Marvel Studios took big creative liberties in creating the film version of Renner's Hawkeye. Comic book Clint was a bachelor and an ex-circus performer; silver-screen Clint is a family-oriented guy and an agent with S.H.I.E.L.D. If Marvel already altered the OG Hawkeye for the screen, why can't the studio do the same with Hawkeye 2.0 and make her his offspring? Like father, like daughter, right? Since the Hawkeye show is expected to run for only six to eight episodes, there will be a definitive conclusion to its story. (No dangling threads here.) The interesting thing about it being a limited series is that Marvel Television and Disney will know far ahead of time how things end and how the series will impact the MCU moving forward. Our guess is that once Clint hands over the Hawkeye name, he just might assume another superhero mantle: that of Captain America. In the comics, after Cap dies in the events of Civil War, Tony Stark approaches Clint and offers him the moniker of Captain America. Clint demonstrates that he is strong enough to be the new Captain America, proving himself the only person capable of properly handling the hero's shield other than Steve Rogers himself. Clint ultimately turns down Tony's proposition — but who's to say that in Avengers: Endgame, things might go differently? It's believed that Captain America might die in Endgame, and if Hawkeye and Iron Man make it out alive, perhaps Clint will be our new Cap in Phase 4 of the MCU. Passing the Hawkeye torch to someone else would free him up, after all. It's also likely that the Hawkeye series could set up the Young Avengers movie, which Marvel reportedly has in the works already. Going by the tentative title of New Avengers, the film is said to feature a "rejuvenated roster" of the teen hero team — including Vision and Scarlet Witch's child Wiccan, Scott Lang's daughter Stature (who is a part of Avengers: Endgame), a new iteration of Vision, Iron Lad, Hulkling, Patriot, and, of course, Kate Bishop. Disney is scheduled to hold an investors presentation tomorrow, Thursday, April 11, so hopefully some additional information about the Hawkeye series — as well as the Loki limited series, the Vision and Scarlet Witch show, and the Falcon and Winter Soldier team-up series.